This is an undisputable truth: Penguins look really dumb. They’re small and awkward and they waddle around aimlessly like broken Roombas. But that’s because they’re on land. Land is not their element. When penguins are in the water, they dance. They swirl. They twirl and catch fish, stunningly at ease with the vicious frigid ocean. BMX bikes are the same. Ungainly and ill-proportioned, with tiny wheels and huge handlebars, they look absurd anywhere but in a skatepark. Once they’re in the park, though, in the hands of a skilled rider, they don’t look so silly anymore. Okay, yes the bikes do still look silly, but what the riders do with them is breathtaking. 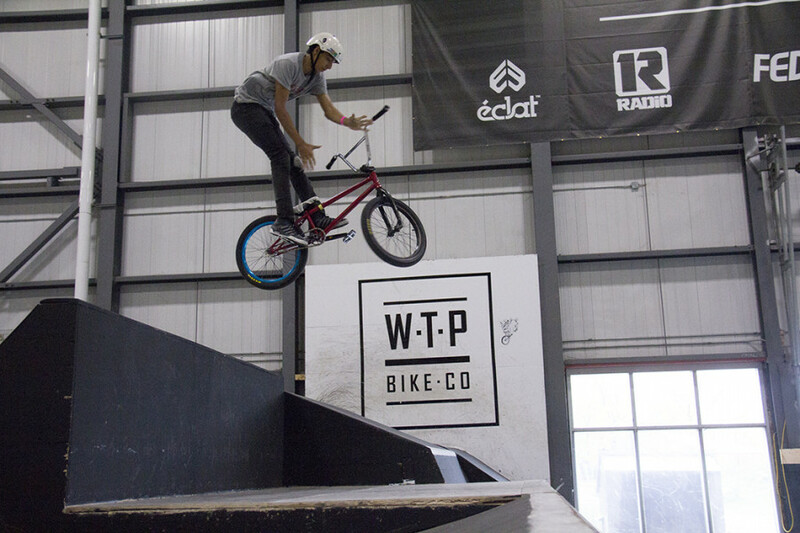 Maxime Chalifour is a skilled BMX rider, and he took everyone’s breath away this weekend at Le Taz Skatepark Pepsi Pro-Amateur competition in Montreal. He’s not one of the amateurs, though, he’s one of the pros. He’s also just 16. “I started when I was 13,” Chalifour says. He lives and goes to high school in Boisbriand, on the North Shore. He saw a BMX competition on TV and thought it looked fun. He tried it. “It gave me the taste,” he says. He’s quiet and restrained in conversation—albeit very sweaty from warming up for the qualification round—which stands in stark contrast to how he rides. On the bike, he’s ferocious. He charges down ramps and pipes, soaring in the air and throwing himself and his bike into aerial pirouettes and neck breaking flips. His pace is relentless, throwing down trick after trick. If he has to bike across the park to get from his last flip to his next jump, he’ll do a wheelie on the way. If he lands on top of a module he did a spinning backflip on, he’ll jump off it and do a barspin on the way down. 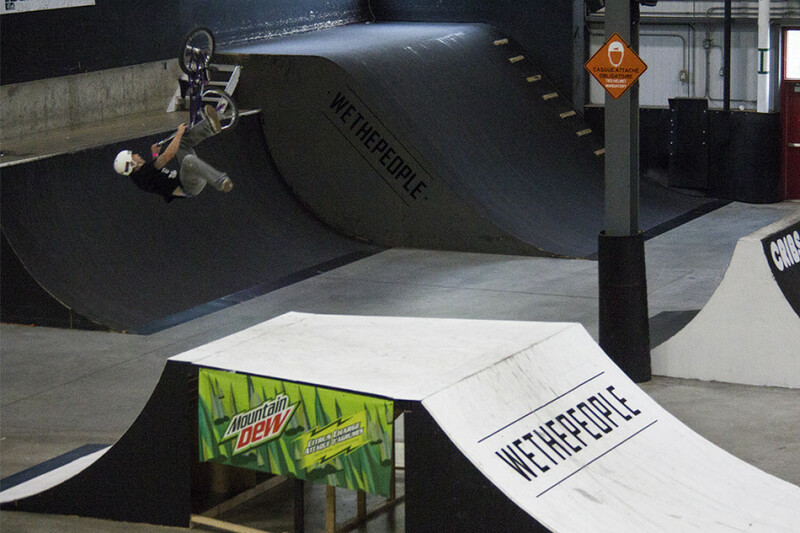 A barspin is when the rider spins the handlebars and the front wheel in mid-air. It’s Chalifour’s favorite trick. He regularly chains them to his other tricks, like when he barrels off a concave sort of bowl while spinning backwards on his bike and sending his bars spinning the other way, somehow putting his hands back on the bar and his bike back in the right direction before he lands. The point is: there can be no idle moments in competition. Chalifour has one minute. He’s going to use it. He has to, as a pro competing against people with ten or more years experience than him. “In pro, people are way more reliable with their maneuvers, they go much higher, they do more tricks, and they chain moves together,” Chalifour says. 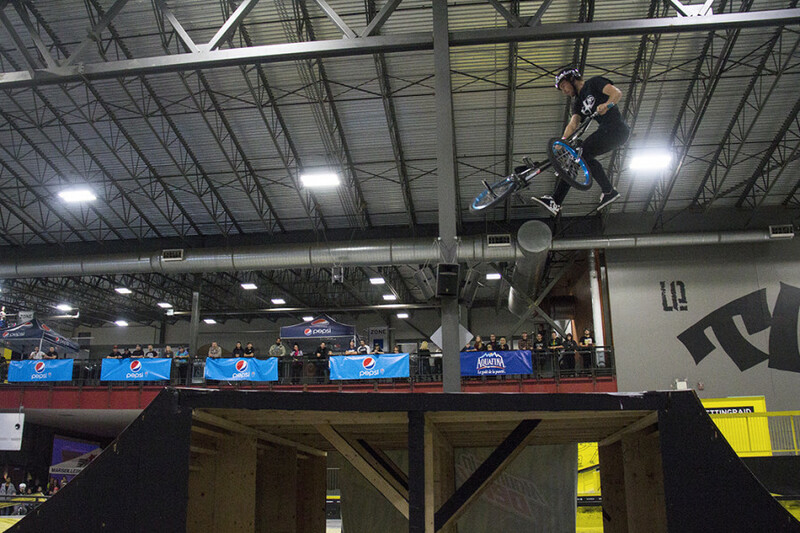 The reliability of the moves, the height, and the intensity of the tricks are how riders are judged in the pro park competition. Riders have two rounds of one minute each to ride. If they fall off their bike, they fail and the round ends. The height and speed that the riders attain on their tiny little bikes is hard to believe without seeing. But it’s the reliability that’s perhaps most impressive. 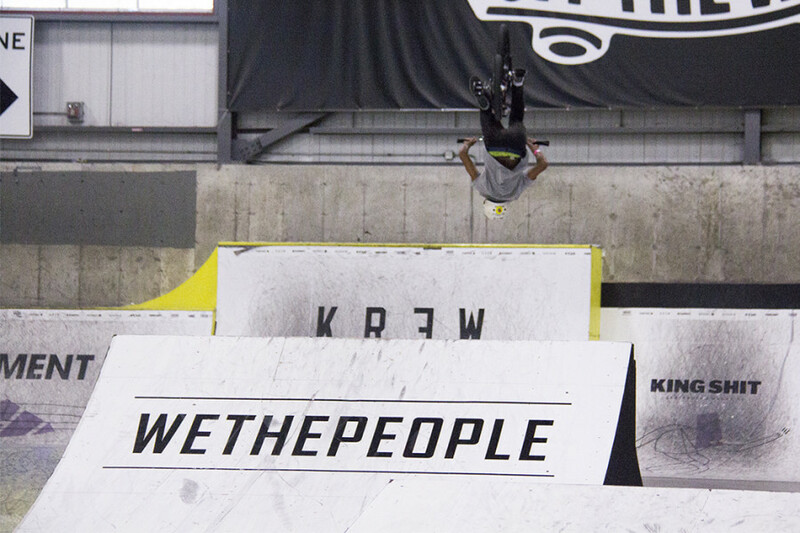 On one move, Chalifour goes up a halfpipe and into the air. There, as if suspended by ropes, he hovers and takes his legs off the bike, still holding the handlebars. The bike spins under him once. Then it spins again. And as he starts to come down, his feet find the pedals, stops the spinning, and he lands and shoots on to the next trick. How long must it take to learn something like that? “It depends,” Chalifour says. “For me it’s slow. It takes a while.” Some moves look easy and are hard, and some look hard but are easy. “So it can be an hour or a week,” he says. Ghyslain Gingras, who runs Le Taz’s operations and puts together the Pro-Am, thinks Chalifour is exemplary of the strength of Montreal’s homegrown talent—which stands out at a competition with participants from as far as Toronto and California. 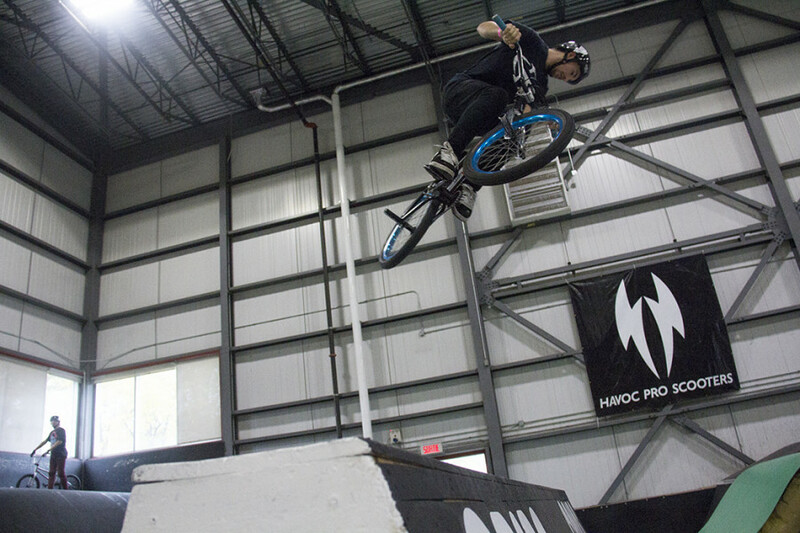 Le Taz, as one of two skateparks of its size in Canada, serves as a major talent-development point. Gingras points to the Le Taz riders who have competed at international events like the Festival International des Sports Extrêmes, held in Montpellier. “We have several athletes who went and did well,” Gingras says. “Joel Bondu, Kevin Fabregue, Jeffrey Whaley, Hugo Larochelle, Dylan Lloyd.” They’ve gone to Mexico, California, and China for competitions, Gingras adds. Chalifour, Gingras says, is also starting to get around. 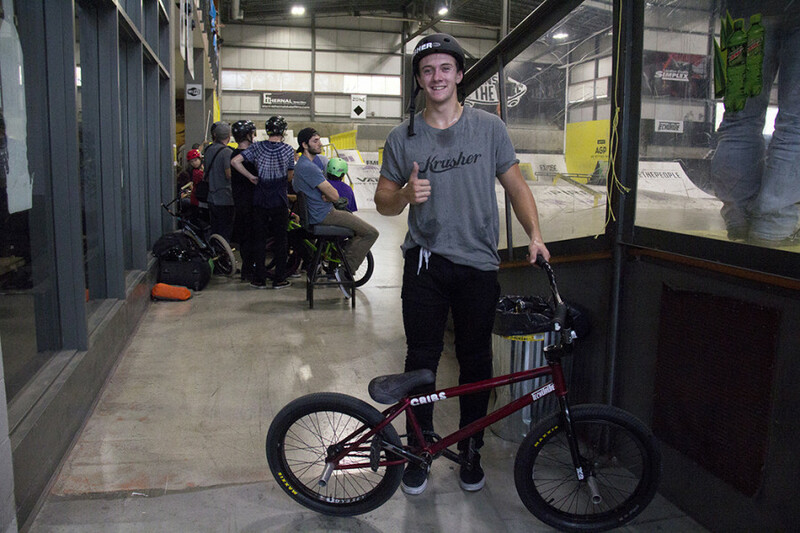 Chalifour competed in his first FISE at the start of October, in Edmonton. And his first pro-level competition was last year’s at Le Taz. He was 15 at the time. Park is Chalifour’s discipline. Go into a skatepark, and do as many tricks on as many jumps as possible—all in one minute. It’s a race against time, and the need to do hard tricks in a rush can result in massive wipeouts. The people like him back. When he starts his qualification round, the crowd cheers. They don’t for anyone else. “He’s like my little protégé,” says Hugo Larochelle, who won the park pro event at Le Taz. Larochelle, 21, says Chalifour is liked because of his age, that he holds his own with riders much older. “We saw from the start to where he’s gotten,” says Kevin Fabregue, also 21, who came second. Getting good at BMX, he says, is extremely difficult. “It’s not like tennis, you can’t really take courses. It’s all on you,” says Fabregue. “Nobody can do it for you,” Larochelle says. Chalifour came fourth, behind Larochelle, Fabregue, and the 21 year-old Californian, Ricky Veronick. For the Le Taz Pepsi Pro-Am to attract international talent is kind of a big deal. For a sport as community-driven as BMX, expanding and connecting those communities is how it progresses. So while he can’t ride anymore, he can push to make the sport and Montreal more visible, and to help develop young talent.